I like to call my fledgling writing career a “Menopausal Epiphany.” I had not written a single creative word (other than school and college essays) until I hit 50 — a landmark year that brought home the ravages of menopause and then some. Fighting Mother Nature was a losing battle, so I decided to put those yo-yoing hormones to creative use instead. My muses came alive along with my menopausal woes, and I started writing articles and short stories for a number of publications. THE DOWRY BRIDE project was born much later, after I had a taste of minor publishing successes. Growing up in India, the horror stories about dowry-related abuse had always been abundant — a wealth of fodder for a creative mind. But thankfully that kind of violence had never touched my life. I was lucky to be born in an enlightened community that eschewed dowry. Nonetheless the disturbing topic stayed in the back of my mind. The fact that atrocities like dowry deaths continue unhindered today in India, despite anti-dowry laws, sparked the idea for the novel. Also, as far as my knowledge went, dowry had not been the main theme in any fiction book published in the United States. I wanted to give American readers a rare glimpse into an archaic practice that still persists in the twenty-first century in certain parts of the world. But in spite of its controversial topic, THE DOWRY BRIDE has all the elements of popular fiction: romance and intrigue, a young bride in jeopardy, a gallant hero, humor and anguish, betrayal and hope. Notwithstanding the drama, adventure, and action essential to a work of fiction, I have tried to paint a realistic portrait of a culture that is simple yet complex in many ways, abundant yet lacking in some areas, progressive yet shockingly primitive. Please visit my website: http://www.shobhanbantwal.com for the book cover, an excerpt, information on the book, my Indian recipes, articles, short fiction, and pictures depicting life in India. 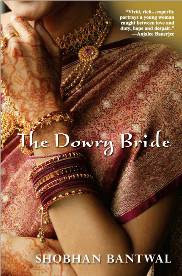 Shobhan Bantwal is the author of THE DOWRY BRIDE (Kensington, Oct. ’07). You can visit her website at http://www.shobhanbantwal.com/.